into a world where the player struggles to defeat any opponents. Playing this game makes you feel the same adventurous feeling as the main character has. To activate the combos for the battle, all you need is tap your character in a certain way at the right time. To improve your pirate gang ability, you can recruit more character under your flag. Those characters have certain ability to help you win the game. You can find supporting character for your pirate gang from the bar. The original characters on the manga and anime series can also be found at this place. At the same time, you should finished several quests on the storyline. Each quest will bring you to epic adventures. Overall, the graphic of this game is relatively decent. 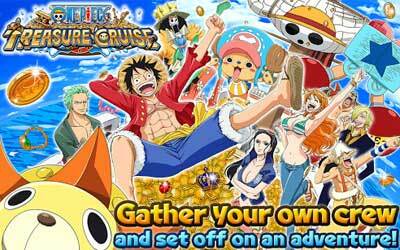 The most notable thing about ONE PIECE TREASURE CRUISE for Android is the storyline that stay true to the original version. If you want to be a pirate and experience exciting adventure, this game is suitable for you. Friend/Guest Captains selection and effects in battle have been improved. Touching the Status Ailment icons during battle will now display it’s effects.